File Boxes are great for packing legal or letter size files combined with heavy duty boxes to pack books or media like CD's, DVD's Tapes as well as office supplies and the content of your desk. Remember to order packing supplies to securely pack your office or library. Starboxes.com offers a full line of the corrugated packing boxes and quality shipping supplies as well as a great selection of moving blankets and furniture pads. Book boxes require special attention when packing. Books along with other volumes that require specific attention and care needs to be separately wrapped in packaging supplies like cushioning foam or bubble rolls and placed on the side in book boxes. If you are packing everyday publications, binding on the books needs to be alternated on end as they're put into book boxes. Paperbacks and journals may be placed over books to fill up void area in moving boxes. The small moving box is perfect for books, paperbacks, and journals! Other products ideal for the small moving boxes is footwear, tools, your kitchen items, restroom supplies, cameras, and many others. Make sure to use protective padding when packaging. Packing paper and bubble rolls provide an excellent shielding buffer to make sure your products get there safely and securely. Small moving boxes are among the ideal sort of storage boxes readily available. 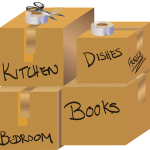 Moving boxes are usually a crucial component associated with a move and without one moving could be just about impossible. Moving boxes are available in several common sizes including small, medium and large size boxes.